If you've ever tried to take a paperback copy of War and Peace on a commute with you, you'll know that a weighty tome doesn't do your balance any favors on a subway journey. A lightweight ereader makes carrying your books with you on the go far more convenient, but Kobo's new limited edition 32GB Aura One reader takes it to another level. That's enough for 28,000 ebooks. 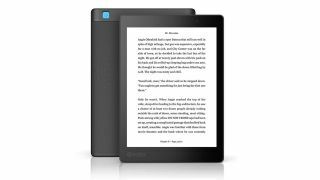 It's an upgraded version of Kobo's existing Aura One ereader, which has 8GB storage as standard, enough for 6,000 ebooks. That would already be enough for a lifetime's worth of reading, but Kobo seems to be targeting a very specific sort of reader with this – those into image-heavy comics and manga. These texts can weigh in at 100MB a go, making a capacious ereader a must-have for a voracious reader. Storage aside, the reader has a solid spec sheet – similar to the one that earned the original Aura One four out of five stars in our review. With a 7.8-inch display packing in a resolution of 1872 x 1404 for 300dpi, it's a backlit screen that uses Kobo's "ComfortLight Pro" technology to reduce blue-light exposure. That's the kind that can upset your sleep patterns. Elsewhere, the ereader features waterproofing secure enough for a pool-side read or a bathtime tale, microUSB charging and data transfer and built-in Wi-Fi (but not 3G). The limited edition ereader goes on sale on December 6, priced at $279.99 (around £210 / AU$ 365). It'll face stiff competition from the new Amazon Kindle Oasis, which is also waterproofed and offers audiobook support for £229.99/$249.99/AU$389, but has far less storage. Which ereader should you buy?